Conscious shopping options are all around us. Here at Reach Yoga we have a few choices that may be just what you are looking for. Our products are chosen for quality and shared values. Need more details? Contact Cathy at Reach Yoga to order. 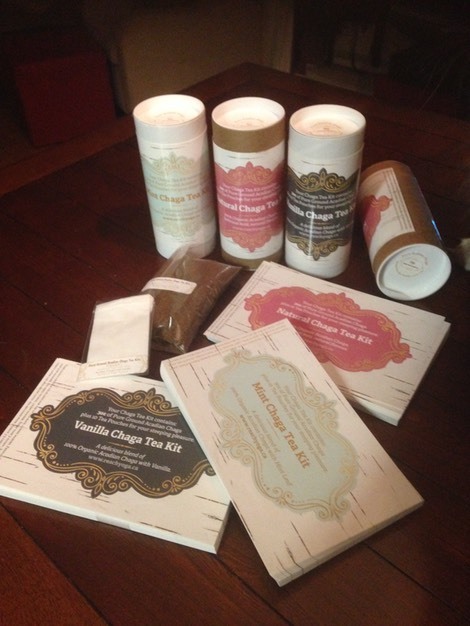 Delicious fine grind Acadian Chaga Tea is NOW AVAILABLE! Assorted Flavours include: Vanilla Sea Salt, Mint, Moka Cardamon, Original, Ginger, Spicy, Limon and more. Ask us what flavours we have in stock! Every set is hand made and created with kindness & good intention. As each bead is strung beautiful words have been sung or spoken. 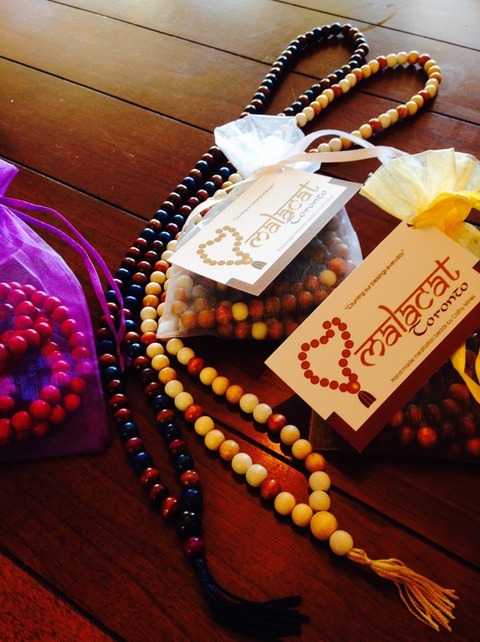 Each mala is made of a string of like sized beads to count your own blessings and 1 larger guru bead used to thank your Teachers. Enjoy the goodness created by kind words. Naturals and vibrant colour options available. This Audio CD has been designed to allow you to Experience Yoga. From the intro meditations, guiding you to put aside your thoughts of the day; to the complete ‘letting go’ in Savasana, your final relaxation. 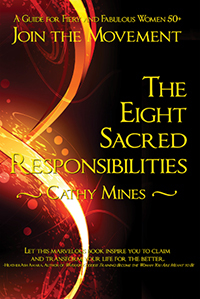 The hypnotic voice of instructor Cathy Mines quickly brings us to a place of peace & calm. Close your eyes and enjoy this 70 minute vocal guide to the experience of yoga. This Audio CD has been designed to allow you to Experience Guided Meditation. Starting at the base of your spine and moving all the way up to the crown of your head. A colourful guided meditation based on the ancient system of the chakras. Instructor Cathy Mines takes you on a journey to all of the nooks and crannies in your energy body. Close your eyes and enjoy this 60 minute vocal guide to the chakras. Click on image for more details or contact Cathy at Reach Yoga to order. Thanks for another way you have authentically brought yoga and inner work off the mat and into our hearts and souls. It wasn’t just the workshops, which were great, it was also the great conversations at meal times. I learned so much and made so many great connections. Reach yoga has saved my children from the fate of a grumpy and stressed out mamma! Yoga at Reach Yoga has more than benefited my life. It has changed my life. I first joined Reach Yoga after a major heartbreak. Yoga with Cathy was instrumental in my healing. It helped to heal my heart, mind, and soul. It gave me hope again and helped me to believe in myself again. I will be forever grateful for that healing and for putting me on the path to seeking inner peace. What a great community you have built, Cathy–and it is you who have built it. Meeting Cathy and the Reach Yoga Community has definitely benefited my life. Cathy’s beautiful yoga spirit has encouraged me to take my practice to a higher level. Her generosity to me during my time of personal transition was incredible, offering me the gift of yoga whenever I needed it. For this, I will always be so grateful. I look forward to continuing to learn and be part of this yoga community. Thank you so much for last night’s spiritual revival!! I want you to know that you have once again been the conduit to a little bit of healing. I am laughing today and I was NOT yesterday!! I am more aware of how I spend my time and re-think how I will spend my time. In the past I might have shopped, where now I find more enjoyment going for a walk, reading a book or being with friends. I don’t need all that stuff that I was shopping for to make me feel good yoga does that for me. I am so happy I found Yoga! Reach Yoga brought me out of the darkness….into this bright light! It provided me with a beautiful community, many friends, a spiritual practice that I adore, a teacher, mentor, psychotherapist, meditation teacher, life coach and more than all of that: a friend. Reach Yoga illuminating the darkness, one heart at a time.